Veggie & Fruit Bin – Neat! 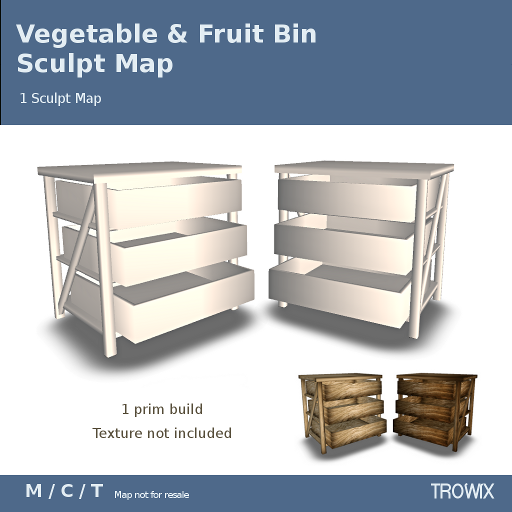 With a down-home rustic look, this hard-working prim was modeled after vegetable and fruit storage bins. But why leave it in the root cellar? 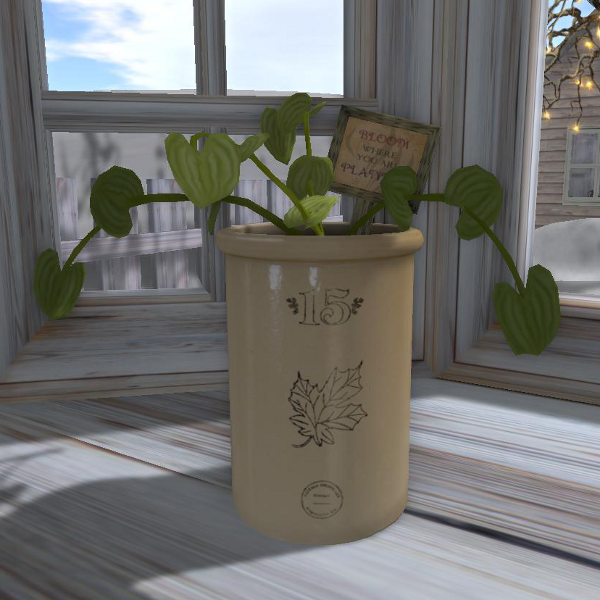 Make planters, seating, paper storage, end tables and the other cute things you’ll think of. Another clever 1 prim sculpt. How does he do that? 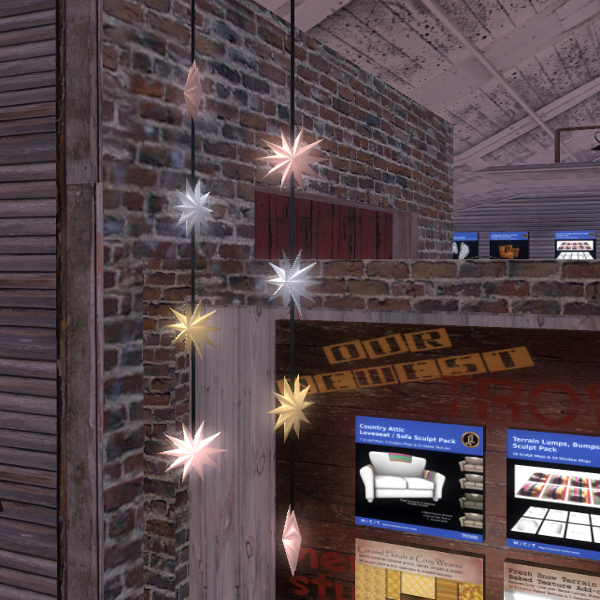 Decor often suffers in SL due to prim allowances — we think this will help! Starting the first little plants in the shed. So, have some fun re-purposing this! I know you can! Classic and Tailored. Rustic and Outdoorsy. 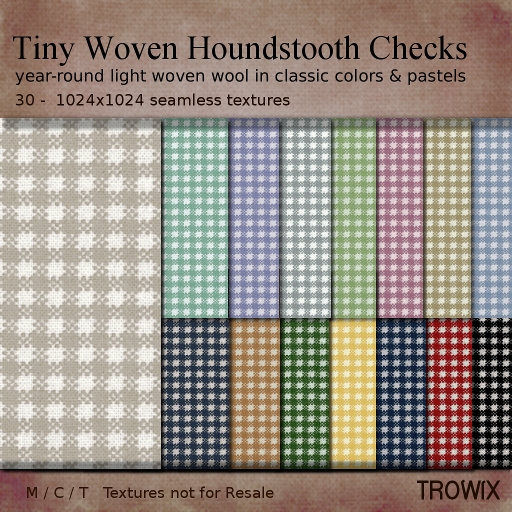 Have it your way with these light-weight woven houndstooth fabrics. Seamless design for ease of use, weave texture for realism. Classic colors and soft pastels. Colors & Colors. Seamless. Realistic Weave. Good stuff! Pastels featured here. Soft & comfy & soft. 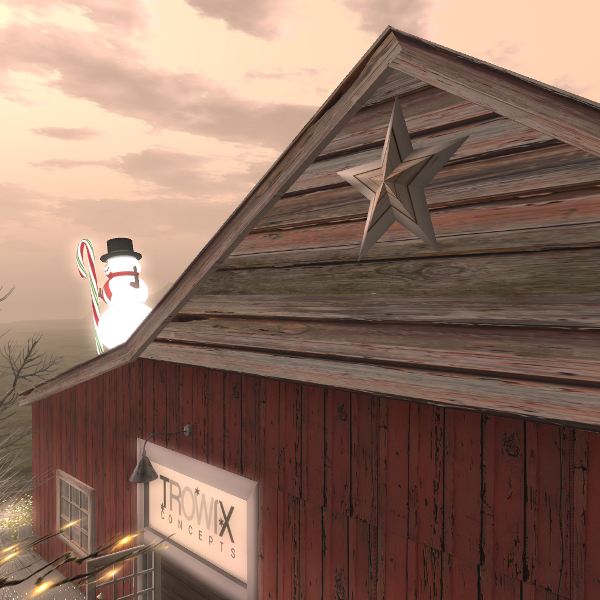 The Trowix Barn or on SL’s Marketplace. Antique Canning Jars – Keepers! 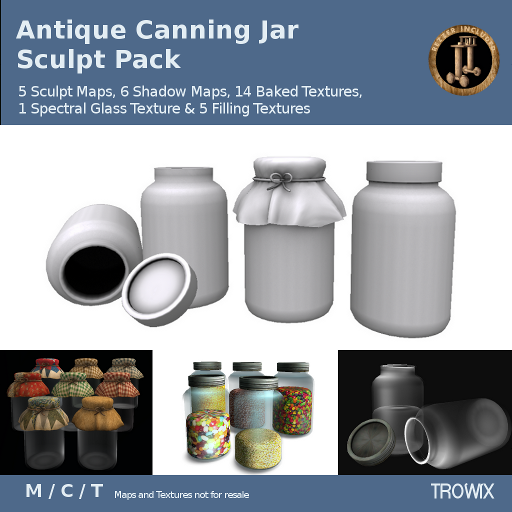 The versatile canning jar used for everything from storage to vases to flowers to glasses and so much more inspired this sculpt pack. It contains everything from jar to twine tied dust topper. Lots of goodies to get you started creating & keep creating. Plenty of textures to get you started creating fast and shadow maps so you can continue creating fun, whimsical and historic pieces. We hope this becomes a building favorite just like the original. 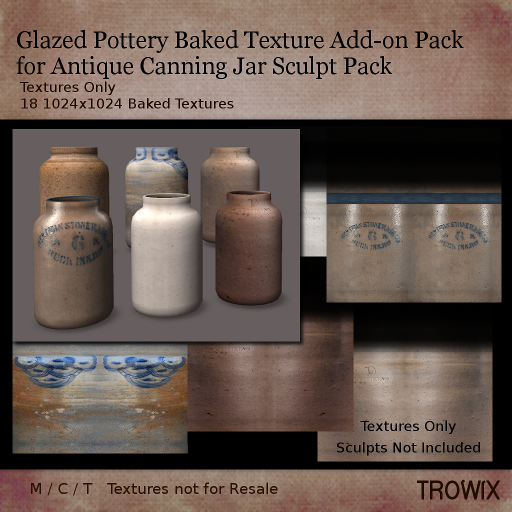 To make our jar sculpts even more versatile, we’ve made a texture add-on pack. It gives a whole new and natural look to the jars. 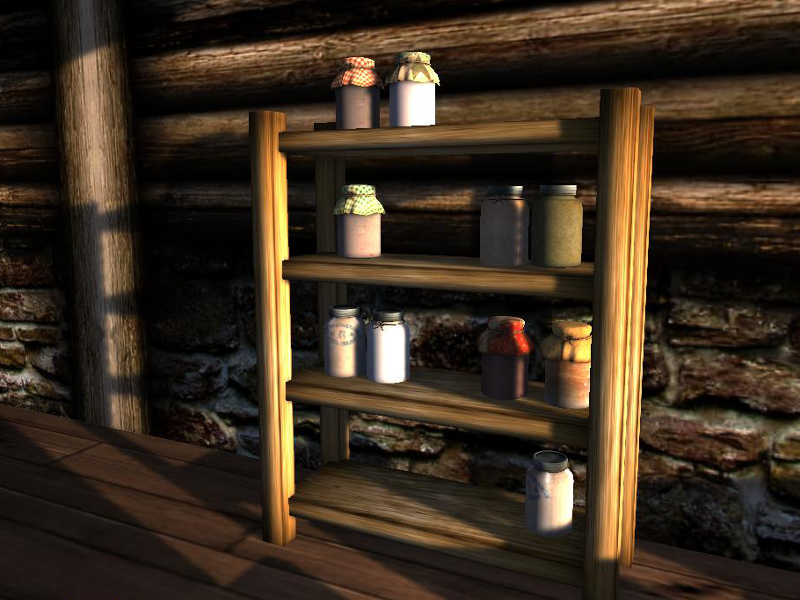 Textures in 3 versions – Jar alone, Jar with metal Lid & Jar with dust cover cloth. More looks for your canning jars. Add flavor to your builds! You know where to find these! 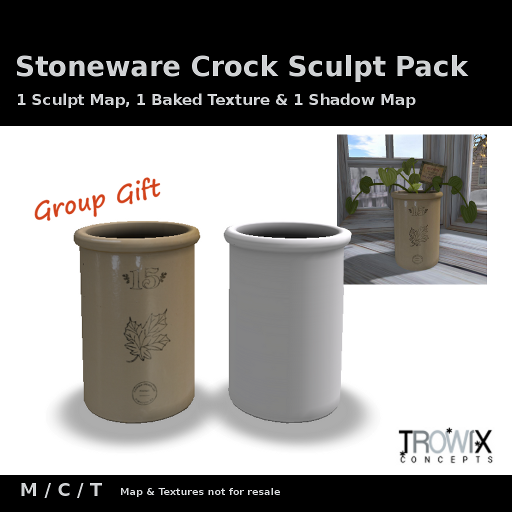 January Group Gift – A Crock! A new year. A new month. A new group gift! …it may be a crock, but it’s practical, down-to-earthy, versatile and we hope a favorite for your builds. A place for plants, bumbershoots, sauerkraut and Eeyore’s birthday balloon – you’ll think of more, you always do! Thank you all for your support, this month and always! You can get this gift only at the Trowix Main Store Barn. Too cute to keep in the closet! 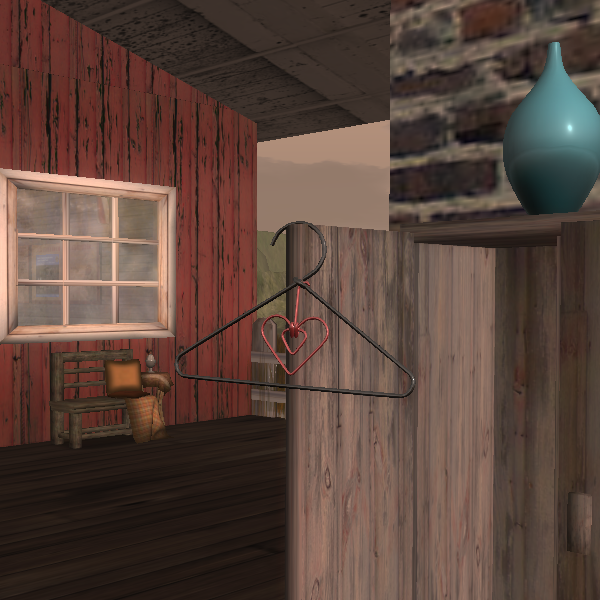 Our latest sculpt pack is really just too cute to keep in a closet, even if it is a clothes hanger. 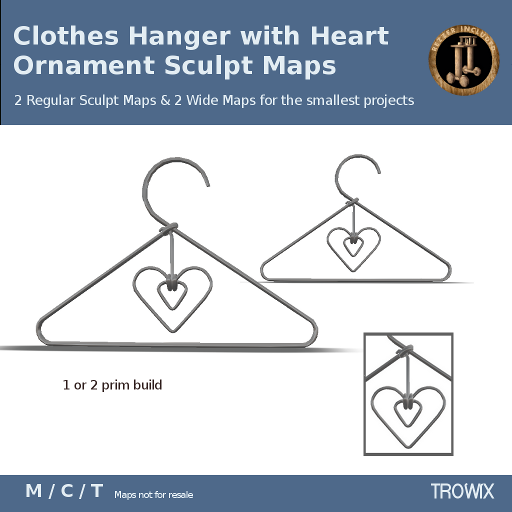 A hanger for towels, lacy-frillies, quilts, ladybugs to crawl on, a thoroughly decorative hanger with an ornamental plus – use the heart alone for even more options. Regular & nano maps for versatility. Texture is not really needed, color and shine work well. 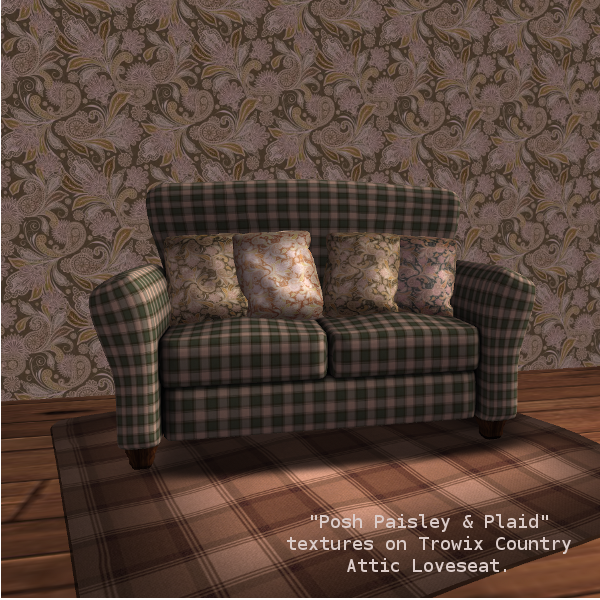 A fun accent for country & shabby styles. Gingham, Ribbon, Lace – Fresh! 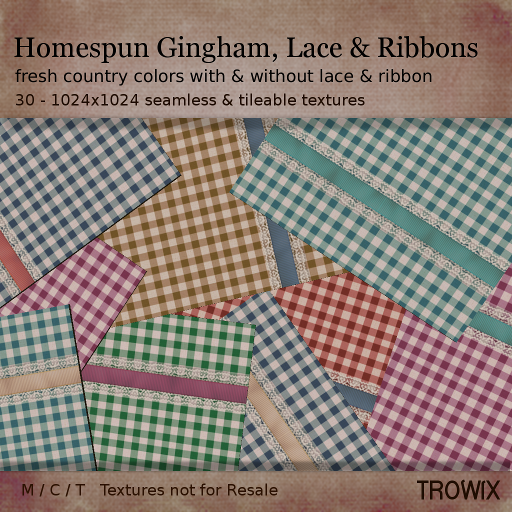 Classic, always fresh Gingham with delicate lace and pretty ribbons in tileable and seamless formats for sweet builds made easy. Plain Ginghams are seamless with a subtle homespun weave. Embellished versions are tileable. A breath of country classic! 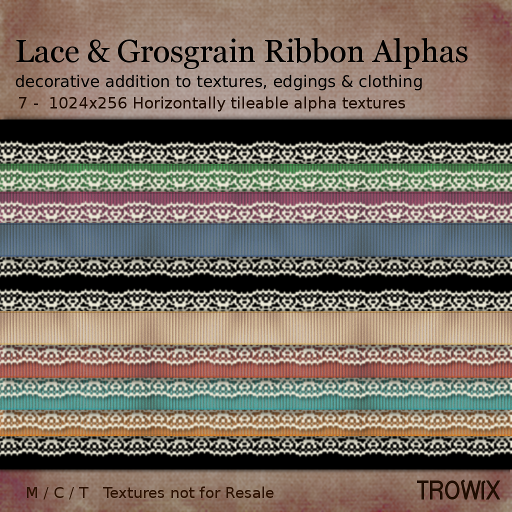 Also an alpha texture pack to add pretty lace and ribbons almost anywhere! Delicate lace and pretty ribbons in a tileable format make these alphas a breeze to use for edging, borders or anywhere you’d like to add a soft accent to a texture or a build. 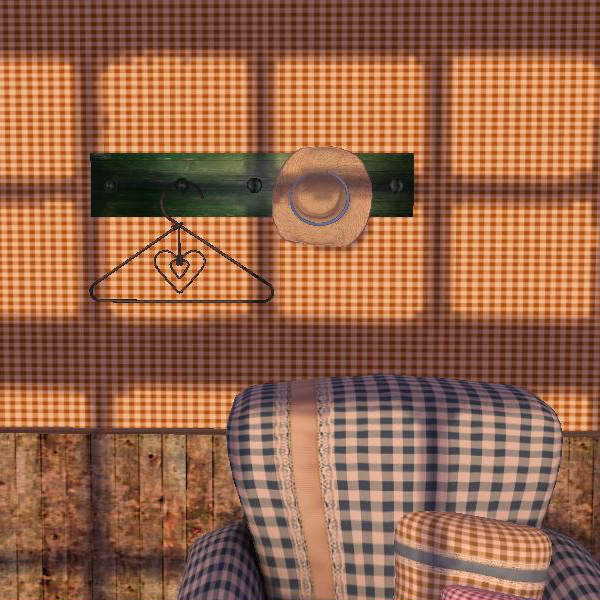 Basic country colors are versatile and, also, match our gingham texture packs. Edgings, borders, texture add-ons — do it all! Pretty things to brighten your winter at the Trowix Barn. Open 24 / 7 for your creative needs! 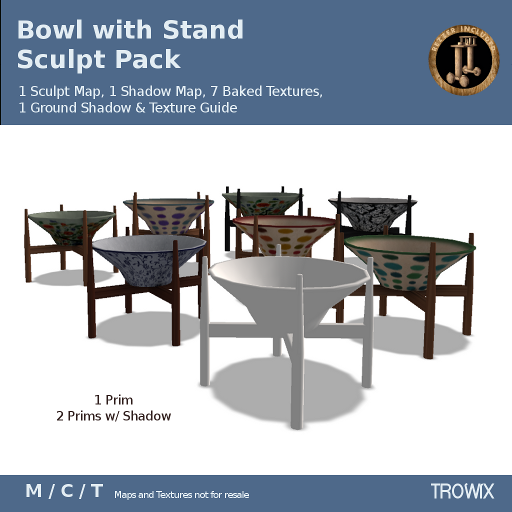 Bowl with Stand – 1 prim! 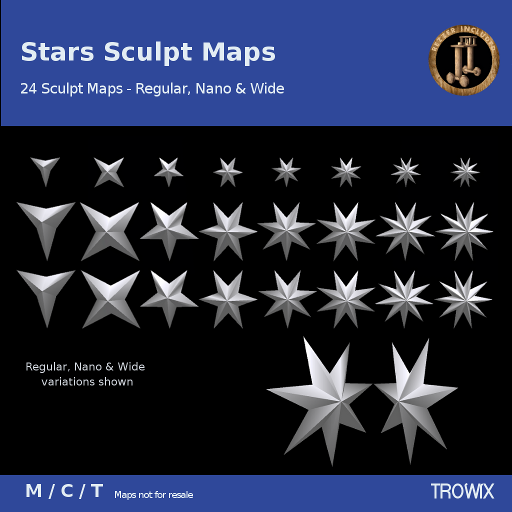 Shadow, shadow map, texture guide – many goodies! There are 7 baked textures to get you started. Oriental to Modern, Classic & Retro looks or make your own. 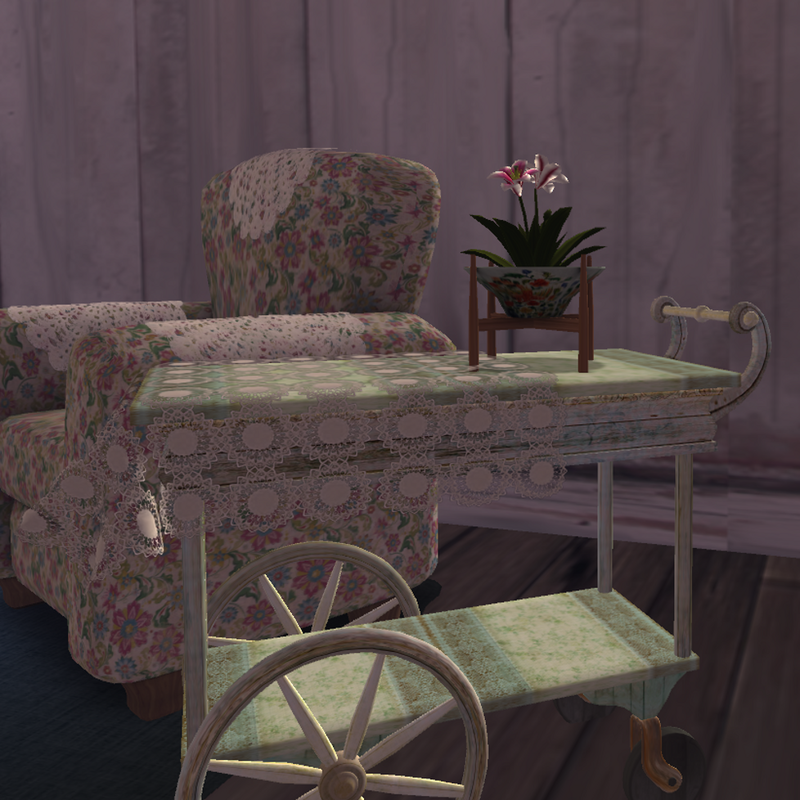 Stop by and see this and other hard-working prims at our Barn ! This texture can be used for personal projects only. 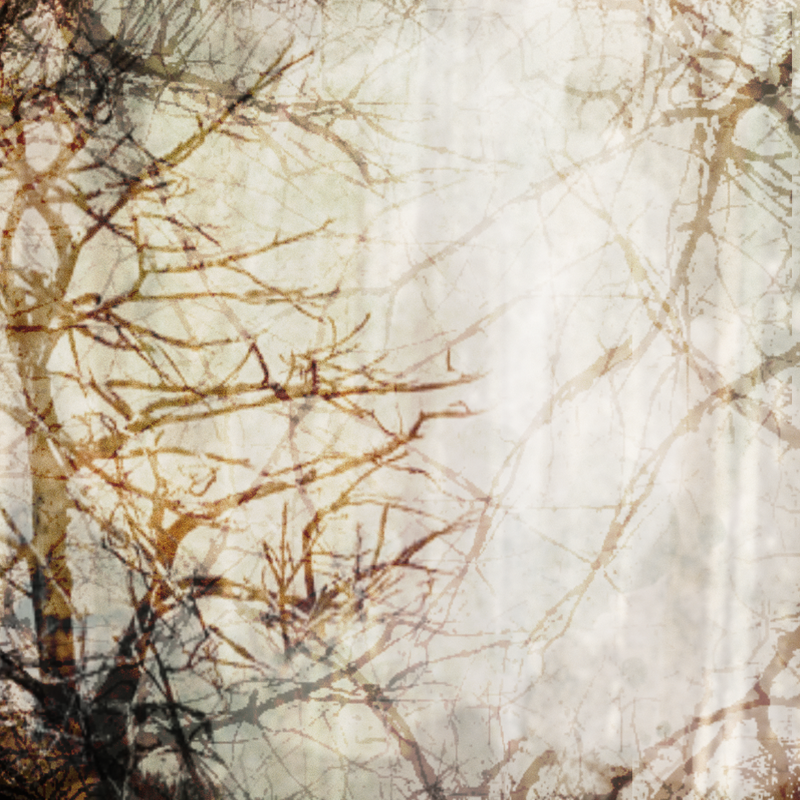 It is not to be used totally or in part to create other textures for commercial sale. It is not to be distributed as a texture or part of a texture pack. It is not to be uploaded to stock texture sites, scrapbooking sites or any other texture distribution sites. 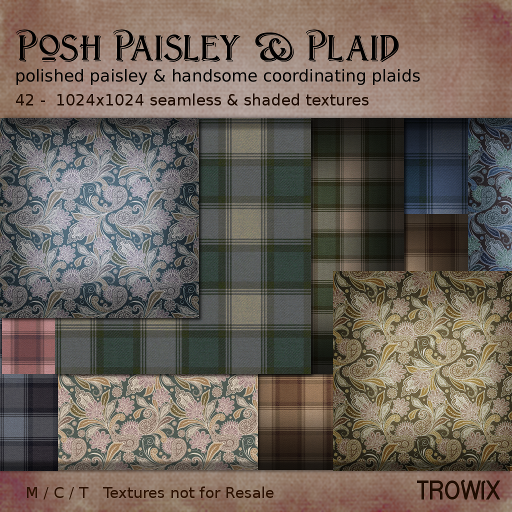 Paisleys & Plaids – Posh! Mmmmmanly, woolly plaids & polished paisley — a match just made for each other. We present to you a large fully seamless fabric pack. I can’t wait to snooze on this! 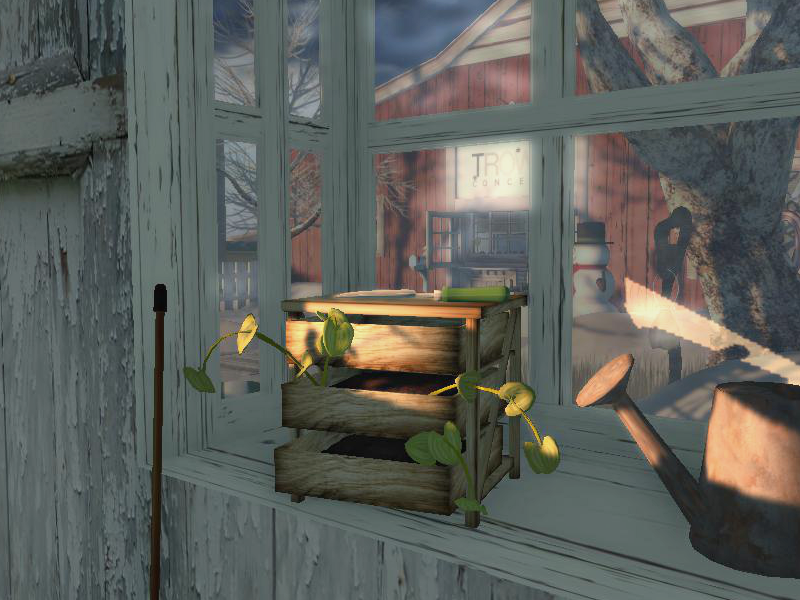 Come get your own snooze-able Winter afternoon textures at the Barn or on SL’s Marketplace. You’re not likely to run out of stars with this pack. Innovative map sizes to assure clean & crisp 1-prim shapes. Highly recommended for jewelry… and anything else! Absolutely *had* to put one on the barn! Here at Trowix we all wish you the happiest, most blessed and cutest New Year you could ever wish for! !